Mexico’s next president will be Andrés Manuel López Obrador, a former Mexico City mayor and outspoken critic of the political establishment both in Mexico and the United States. The 64-year-old leftist, who had for months led a crowded presidential field, beat three competitors on July 1 to triumph in his third presidential bid. López Obrador won 53 percent of the vote, according to the latest official count. His closest contender, Ricardo Anaya – who formed an unusual right-left alliance late last year in a futile attempt to overtake López Obrador – earned 25 percent of votes. Just 16 percent of voters chose the ruling party candidate, José Antonio Meade, of the Revolutionary Institutional Party. With 18,000 other public offices up for election, from mayors to senators, this was Mexico’s biggest and most expensive election ever. It was also the most violent in Mexico’s modern history. At least 136 candidates and political operatives were killed on the campaign trail, apparently assassinated by organized crime groups seeking to maintain their grip on power. The four presidential candidates argued over many issues, including how to tackle Mexico’s record-high violence and systemic inequality. Many of López Obrador’s lofty campaign commitments, which include giving amnesty to drug kingpins and rooting out political corruption, remain short on specific details. It is unclear, for example, how his government will pay for all the social programs he has promised, or what its stance on social issues like abortion will be considering that his Morena party aligned with the right-wing Social Encounter party to build its electoral coalition. One thing was clear by the end of the campaign, which coincided with a new Trump administration policy of criminally prosecuting all migrants who cross the U.S.-Mexico border: Mexico would no longer help enforce the immigration laws of its neighbor to the north. Despite Trump’s repeated claims that Mexico does “nothing” to stop Central American migrants from reaching the United States, Mexico has been a proactive partner in U.S. immigration enforcement. Outgoing President Peña Nieto, who was constitutionally prohibited from seeking re-election, accepted US$90 million in American funding to launch the Southern Border Program in 2014, aimed at deterring migration across Mexico’s border with Guatemala and apprehending migrants who journey through the country. Mexican deportations of Central Americans traveling to the U.S. – primarily Guatemalans, Hondurans and Salvadorans – soon doubled, from 78,733 in 2013 to 176,726 in 2015. During the same period, U.S. border agents detained half as many Central American migrants at the border. Migration patterns in the region have changed radically in recent decades. The number of Mexicans apprehended crossing illegally into the U.S. has plummeted, from more than 1.6 million in 2000 to 130,000 last year. More Mexicans are now leaving the U.S. than arriving. Central Americans, driven by pervasive violence and poverty, currently make up the bulk of people who cross the U.S.-Mexico border. In 2017, U.S. Border Patrol agents there arrested 303,916 migrants. Just over half of them – 162,891 people – were from Guatemala, Honduras and El Salvador. Mexico has thus become a major transit country for migrants. It is also, increasingly, their final destination. Mexico saw 12,700 asylum requests from Central American refugees in 2017, up from 8,800 in 2016 and 3,400 in 2015. Only the U.S. received more Central American asylum-seekers, according to the United Nations Refugee Agency. An early critic of President Peña Nieto’s policy of arresting and deporting Central Americans, López Obrador accused the Mexican government of committing human rights violations against migrants. López Obrador wants Mexico to respect existing laws that protect the human rights of migrants. The Mexican Constitution has guaranteed that asylum-seekers can find refuge in its borders since 2016. In his first interview as president-elect, aired on July 2, López Obrador thanked President Trump for a congratulatory tweet posted on election night. He also said he “will not fight” Trump. Mexico will respect the American government, López Obrador said, because it expects respect from the U.S.
Actually getting that respect may be tough, as his predecessor learned the hard way. In August 2016, President Peña Nieto’s advisers invited Trump, whose 2016 campaign was fueled by promises to build a “big, fat, beautiful” border wall, to come to Mexico. Trump’s August 2016 visit to Mexico was calamitous for outgoing Mexican President Enrique Peña Nieto and his party. Trump later ridiculed his Mexican counterpart, insisting that the U.S. needed a border wall. Peña Nieto never recovered from this diplomatic disaster. Almost 90 percent of Mexican citizens said they were offended by Trump’s visit and by their president’s submissive behavior. Peña Nieto’s approval rating plunged to below 25 percent and stayed there. His Revolutionary Institutional Party, or PRI, paid the price in this election. Candidate José Antonio Meade finished in third place, and the PRI lost eight senate seats and eight governor’s races. It may lose several more seats that are still being contested. 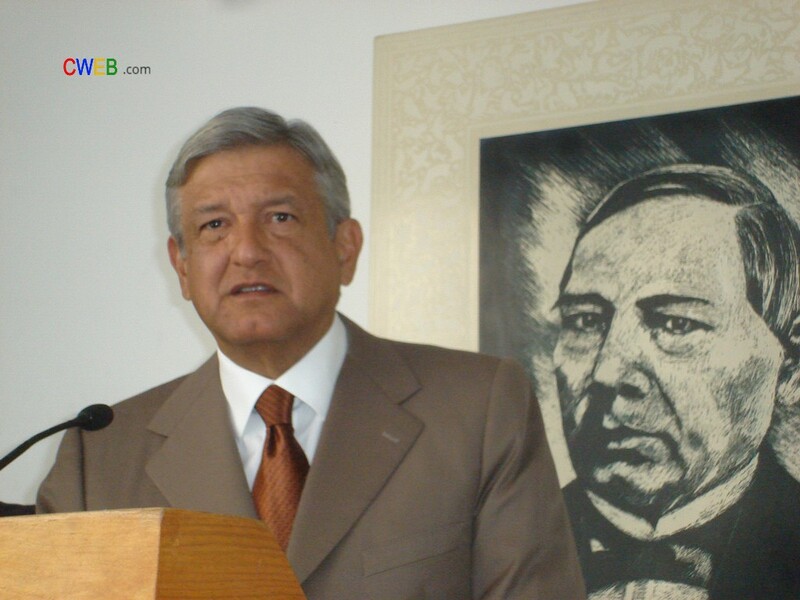 López Obrador benefited from Peña Nieto’s mistakes. His young Morena party, which was founded in 2014, won a legislative majority on July 1. Its candidate for mayor of Mexico City, Claudia Sheinbaum, also won. She will be the first woman elected to lead the Mexican capital. López Obrador’s self-aggrandizement has some Mexican political onlookers worried. He sold himself to voters as a revolutionary figure, saying his presidency will be the latest phase in Mexico’s 200-year progressive political transformation, which began with winning independence from Spain, in 1821, continued in the 1850s with the War of Reform, which consolidated republican liberalism in Mexico, and expanded during the 1910 Mexican Revolution. Mexico is entering a new era, as is the U.S.-Mexico relationship. But no one – probably not even Mexico’s future president – knows quite what that means.